With a few versions of Windows 10 out now, Microsoft is working on some big changes that may completely change how we work on a Windows machine. 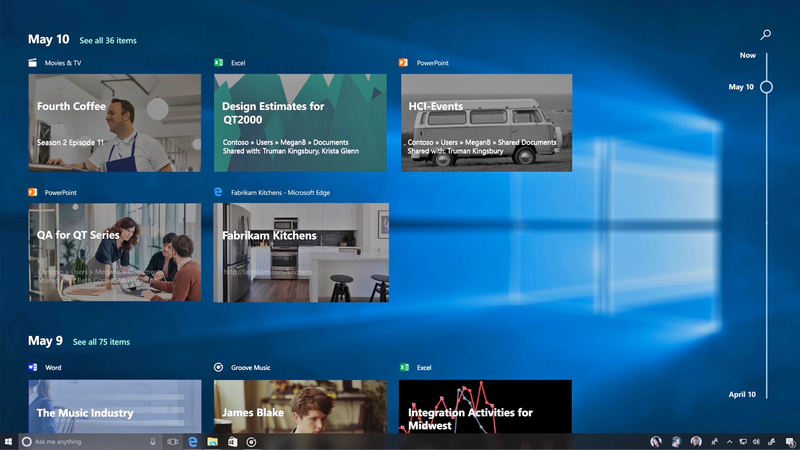 Taking inspiration from how browsers work, the Redmond software maker has revealed some information about a new tab-based multi-window interface for Windows 10 that would make it easier for users to multitask and get back to a project at a later time. Many of the most important things we do happen across apps, web sites and PCs – whether that’s writing a report for school, planning a trip, managing a complex project at work – or even flipping back and forth between playing a game and watching a game. In today’s evolving modern workplace, we work on sets of things in fits and starts, often in between other commitments. We spend time setting things up just the way we want them for a project, with all our files, websites, notes and apps at hand – only to be pulled away at the last minute by a call, a meeting or some other interruption that seem to happen throughout our busy days. And, that’s the moment we’re focusing on, that moment when you have everything ready to be worked on but are pulled away. We believe there’s an easier way to organize your stuff and get back to what you were doing. Sets will essentially put together stuff that belongs together, making things more productive. When we talk about connected stuff, it includes files, documents, apps and even web pages that may be relevant to a project. The concept behind this experience is to make sure that everything related to your task: relevant webpages, research documents, necessary files and applications, is connected and available to you in one click. As Office, Windows and Edge become more integrated to create a seamless experience, so you can get back to what’s important and be productive, recapturing that moment, saving time – we believe that’s the true value of Sets. The feature may sound a little like Chrome OS, but the company intends to make it even more powerful and useful. Just like how you use tabs in the Edge browser, users will open a new tab within a window by clicking the + button. For example, you fire up Microsoft Word to start working on a project, hit the + button in the same window to open a new tab. 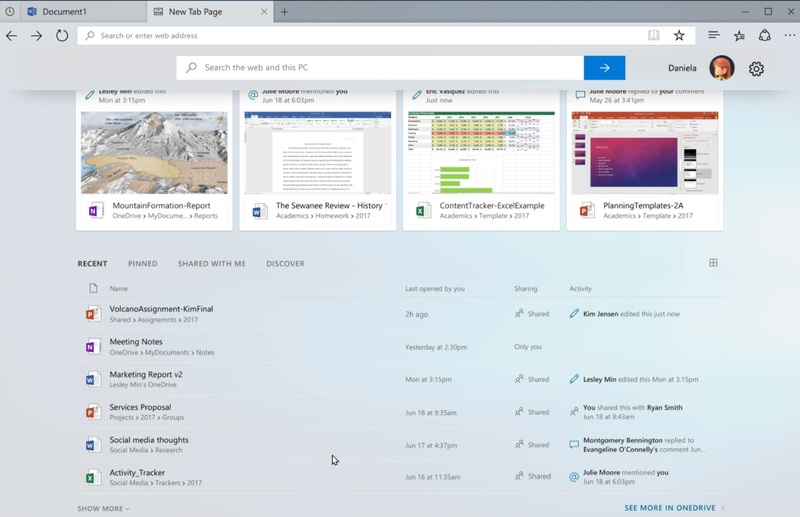 This new tab will show your most recent documents, apps and webpages, with a search bar for web and local files. What you open in this tab will also appear along with the other data that was already present in the Window. From Word document to a webpage and the Mail app from where you were taking data or ideas for your project – all the relevant stuff will be in one place. Initially, Sets will only work with Universal Windows apps, like Mail, Calendar, and Edge. After that, simpler apps like Notepad and then more complex programs like Photoshop will be supported. Timeline is another new feature that Microsoft is currently working on. Microsoft writes that Sets will work along with Timeline to increase productivity. While Sets allows a user to keep a set of apps and data for a particular project in one place, Timeline enables users to move to a project’s timeline in the past or even on different machines. “Today people work and play across multiple applications, platforms and devices and we want to make this easier and more seamless for our customers, so they can focus on what’s important – creating and getting things done,” the company said. Earlier this year at Build, we showed you Timeline, which allows you to jump back in time, making it easier to find the files you’re looking for. A visual timeline is integrated directly into Task View so you can easily move back into files, apps, and sites as if you never left. Microsoft notes that the two standalone features will drastically change how we work on Windows. Since Windows users are bound to have some strong feelings about these new, massive changes, the company is being very careful about how these are being developed and then rolled out, taking user input on the way. Microsoft promises that they will only “be broadly available when they are ready, not necessarily tied to the next major update”. Hopefully, this won’t be a disastrous repetition of the Windows 8 experience.